My name is Chantal Kers. I am from the Montreal suburbs, in Quebec, Canada. I am a true teachermom; meaning I cannot ever separate the mom from the teacher or the teacher from the mom. 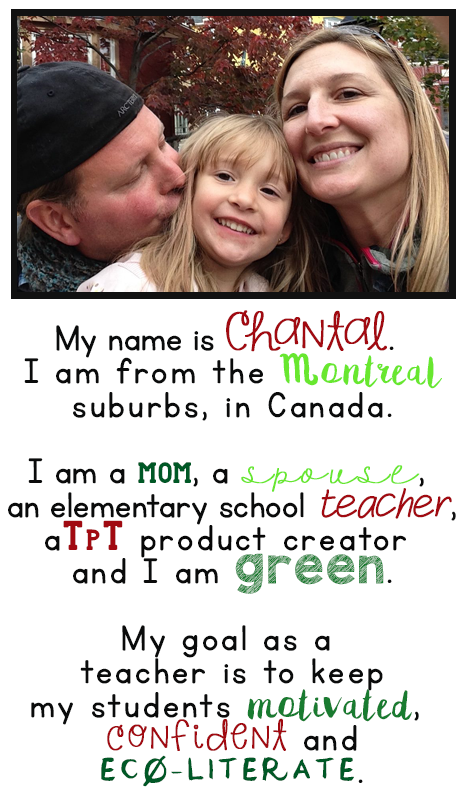 I am green and encourage my daughter and students to be eco-responsible and to be good global citizens. I like tacos, yoga and raspberry ice tea. I like summer, really dislike the cold and I dream of finally traveling and exploring the world with my family. My goal is to help kids become confident and empowered people. I would like for them to know that they have the strength, creativity, and heart to create positive change in the world. Children can change their own actions and words to have a positive impact on the world every day. I have an Early Childhood and Elementary Education Specialization degree from Concordia University, in Montreal. I began my teaching career teaching English as a Second Language to students from my local French school board and have since become a homeroom elementary school teacher for the English school board. In my 14 years of teaching, have taught all grades, from kindergarten to sixth. I also spent a short period working as a pedagogical consultant for my school board, focusing on homeschooling, integrating technology in the classroom and determining and meeting the needs of new teachers.